In the April update of Power BI Desktop we added the ability to import and export the linguistic schema for your model. When you ask Q&A a question it tries to parse your question and identify the nouns, verbs, adjectives, and other elements of the question. In the linguistic schema you tag columns in the table as different grammatic elements to help it do this, and define words that a users might use to phrase a question. For instance, you state the columns that are the subject and the object of the verb. Q&A uses all this information together with any enhancements that you make to provide a better answer, auto completion, and summary of the questions. You can use the Synonyms pane to add alternative words that users can use to refer to tables, columns, and measures in your model. To add phrasings to your model you'll manually edit the linguistic schema. You can export and import the linguistic for a model by opening it in Power BI Desktop, going to the Modeling tab in the ribbon, finding the Q&A group and clicking Linguistic Schema. Learning from examples is a good way to start editing your own linguistic schemas. You can download a sample .yaml file and sample .pbix file from here. These contain examples of common phrasings and synonyms for an Olympic medals dataset. Linguistic schema files are represented in a YAML format. This format is related to the very popular JSON format but provides a more flexible and easier-to-read syntax. We recommend using Visual Studio Code to edit linguistic schema YAML files. Visual Studio Code includes out-of-the-box support for YAML files and can be extended to specifically validate that files conform to the Power BI linguistic schema format. Double-click on a linguistic schema YAML file (.lsdl.yaml) that you exported from Power BI Desktop. 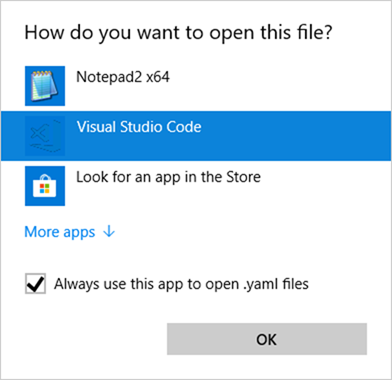 Choose “Visual Studio Code” and select “Always use this app to open .yaml files”. When you first export your linguistic schema from Desktop, most or all of the content in the file will be automatically generated by the Q&A engine. These generated entities, words (synonyms), relationships and phrasings are designated with a State: Generated tag and are included in the file mostly for informational purposes but can be a useful starting point for your own changes. When you import your linguistic schema file back into Power BI Desktop, anything that is marked State: Generated is actually ignored (and later regenerated) so if you’d like to make a change to some generated content, make sure to remove the corresponding State: Generated tag as well. Similarly, if you want to remove some generated content, you’ll need to change the State: Generated tag to State: Deleted so that it won’t be regenerated when you import your linguistic schema file. A phrasing is how you talk about (or “phrase”) the relationships between things. For example, to describe the relationship between customers and products, you might say “customers buy products”. Or to describe the relationship between customers and ages, you might say “ages indicate how old customers are”. Or to describe the relationship between customers and phone numbers, you might simply say “customers have phone numbers”. These phrasings come in a variety of shapes and sizes. Some correspond directly with relationships in the semantic model. Some relate columns with their containing tables. Others relate multiple tables and columns together in complex relationships. In all cases, they describe how things are related using everyday terms. Where Do Phrasings Come From? Model relationships result in default phrasings for both directions of the relationship like “orders have products” and “products have orders”. There are plenty of ways your users will talk about things that Q&A can’t guess, however. For those, you may want to add your own phrasings manually. Why Should I Add Phrasings? The first reason for adding a phrasing is to define a new term. For example, if you want to be able to ask “list the oldest customers”, you must first teach Q&A what you mean by “old”. You would do so by adding a phrasing like “ages indicate how old customers are”. The second reason for adding a phrasing is to resolve ambiguity. Basic keyword search only goes so far when words have more than one meaning. For example, “flights to Chicago” means something quite different than “flights from Chicago”, but Q&A won’t know which one you mean unless you add the phrasings “flights are from departure cities” and “flights are to arrival cities”. Similarly, the distinction between “cars that John sold to Mary” and “cars that John bought from Mary” will only be understood once you add the phrasings “customers buy cars from employees” and “employees sell customers cars”. The final reason for adding a phrasing is to improve restatements. Rather than Q&A echoing back to you “Show the customers and their products”, it would be clearer if it were to say “Show the customers and the products they bought” or “Show the customers and the products they reviewed”, depending on how it understood the question. Adding custom phrasings allows restatements to be more explicit and unambiguous. What Kinds of Phrasings Are There? A noun is a person, place, or thing. A verb is an action or state of being. An adjective is a descriptive word that modifies a noun. What is the category of each product? The overwhelming majority of attribute phrasings needed in your model will be automatically generated, based on table/column containment and model relationships, so you typically won’t need to create them yourself. What did Robert King buy? Assuming you used a sensible naming convention for name columns in your model (e.g. “Name” or “ProductName” rather than “PrdNm”), the majority of name phrasings needed in your model will be automatically generated, so you usually won’t need to create them yourself. Adjective phrasings define new adjectives used describe things in your model. For example, a “happy customers are customers where rating > 6” phrasing is needed to ask questions like “list the happy customers in Des Moines”. There are several forms of adjective phrasings, for use in different situations. Which rivers are the longest? How long is the Rio Grande? Noun phrasings define new nouns that describe subsets of things in your model. For example, a “flops are movies where net profit < 0” phrasing is needed to ask questions like “count the flops by year”. There are two forms of noun phrasings, for use in different situations. Which city is John Galt in? How many books are by Stephen Pinker? Who sold what to whom? Which employee sold chai to John? How many customers were sold chai by Mary? List the products that Mary sold to John. Which discontinued products were sold to Chicago customers by Boston employees? How many athletes won a gold medal at the Visa Championships? Which customers were given a refund for cheese? At which competition did Danell Leyva win a bronze medal? Some verb phrasings are created automatically when a column is recognized as containing both a verb and a preposition. Frequently, a single relationship can be described in more than one way. In this case, a single relationship can have more than one phrasing. It is quite common for the relationship between a table entity and a column entity to have both an attribute phrasing and another phrasing. For example, in the relationship between customer and customer name, you will want both an attribute phrasing (e.g. “customers have names”) and a name phrasing (e.g. “customer names are the names of customers”) so you can ask both types of questions. Another example would be adding the alternate phrasing “employees sell customers products” to the “customers buy products from employees” relationship. Note that you do not need to add variations like “employees sell products to customers” or “products are sold to customers by employees”, since the “by” and “to” variations of the subject and indirect object are inferred automatically by Q&A.